Recently, My Man had a milestone birthday—the kind of birthday that called for mild consoling, a new level of intimacy with his primary care physician, celebration and chocolate cake. We hosted a casual dinner with some close friends to mark the big event. It was a wonderful night full of good food, good friends, and good conversation. Our friends are all decent excellent conversationalists, but sometimes at a big table you end up only talking to the person seated beside you. Ever advocates for the unified larger group conversation, we had our guests play The Question Game. 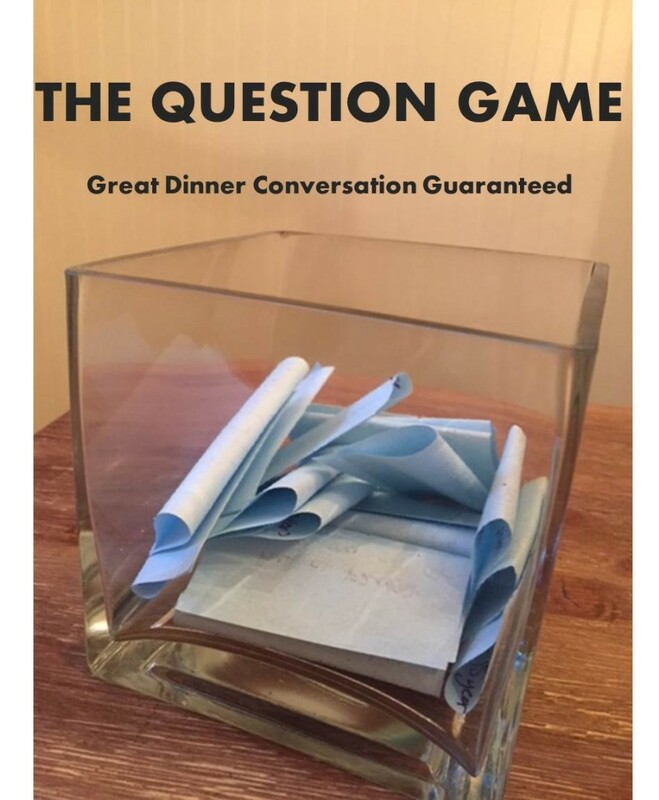 It is not a game really, but a surefire way to facilitate quality convo at dinner parties. This is great to do with new friends and old friends and strangers and family members and strange family members. Here is how it went down: Before the party, I came up with a list of questions and wrote each one on a sealed post-it. I put all the post-its in a vase and placed the vase (and a few bottles of wine) at the center of the table. 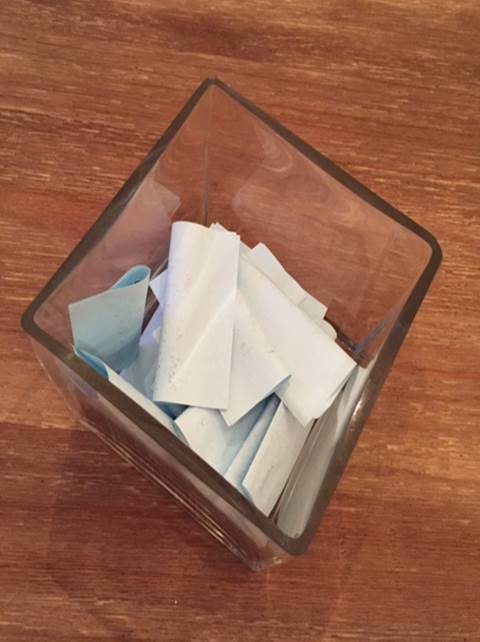 Each person took a turn picking a question to answer. There was depth, there was laughter, and I learned something new about even my oldest friends. I have written my questions out below. You can use them as a jumping-off point to draft your own, or simply print these, cut them into strips, and pull them out at your next dinner party. Everyone can answer the same question or each person can answer their own. You are a grownup and you can make your own rules. What are you freakishly good at? What are you embarrassingly bad at? What are two things you are looking forward to this year? If you had an extra $200 a week to spend on yourself, what would you do with it? What was the best book you read last year? What are you reading now? Who is someone in your life that you wish you could spend more time with? What was your proudest moment from the past year? Name three people (dead or alive) that you would like to have dinner with and why. What is the best gift you’ve ever given? What is the best gift you’ve ever received? What is your biggest fear? What was your biggest fear as a child, teenager, young adult? If all of your friends and family members were asked to describe you, who would provide the most accurate description (excluding your spouse)? What would they say that not many people know? What advice would you give your 15-year-old self? Your 25-year-old self? What was the worst date you’ve ever been on? Best date? Is there something in your life you hope is different this time next year? Have you ever read a book or seen a movie that has changed you or your outlook? Has a book or movie ever made you change a behavior? What is one trait of yours you hope your children inherit? What is one trait of yours you hope they don’t inherit? Have you ever totally changed your mind about something? Have you ever done something you said or thought you’d never do? Go fourth and get talking.